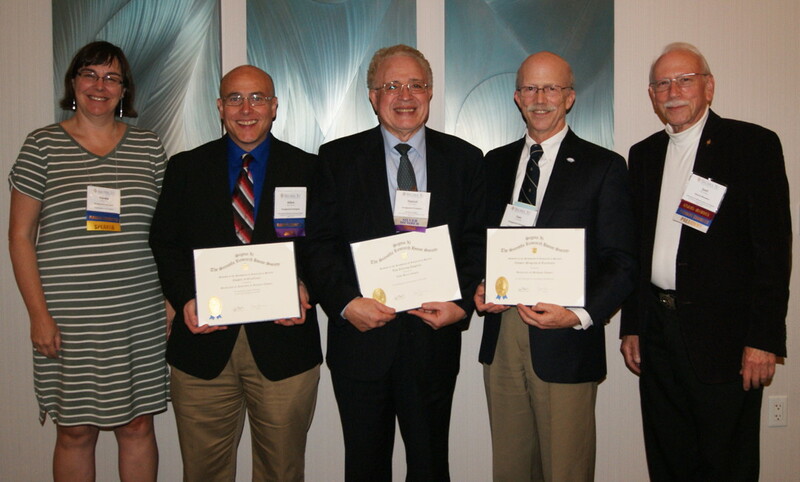 Henry (Gus) Buchtel, second from right, the president of the University of Michigan Sigma Xi Chapter, accepted a Chapter Program of Excellence Award from Sigma Xi, The Scientific Research Honor Society on October 25 at the Society’s Annual Meeting in Burlingame, California. The award recognizes the chapter for hosting an outstanding program in 2017–2018. The chapter was awarded for its Ethics Symposium on Gene Editing. Also pictured, from left, is Emma Perry, chair of the Sigma Xi Committee on Qualifications and Membership which selected the chapter winners, with other chapter award winners who were present at the meeting: Allen Thomas of the University of Nebraska at Kearney Sigma Xi Chapter and Jay Daniel Britton of the John Deere Sigma Xi Chapter. On the right is Sigma Xi 2017-2018 President Joel Primack.